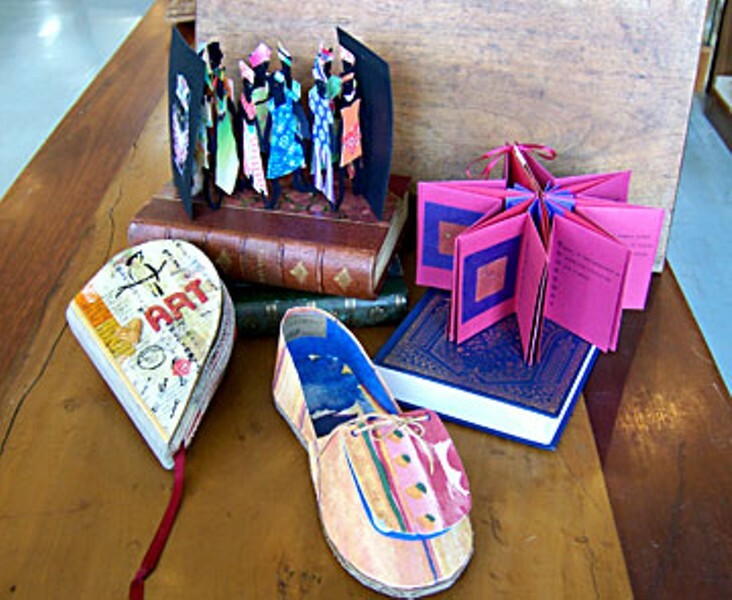 Art by NORBAG, the North Redwoods Book Arts Guild, will be on display at Eureka Books on Arts Alive!, Feb. 2. If there's one thing I've learned over the 15 years Eureka's Arts Alive! has been in existence, it's that some of the most interesting art is often found in unexpected places. I considered this fact as Scott Brown led me toward the back of Eureka Books, weaving his way through shelves, tables, chairs and boxes overflowing with books and prints and pamphlets. When we got to an area with a vague, employee-only feel, Brown ducked around a corner and into a book-lined niche. "Here they are," he said. The hand-made books — featuring a wide array of whimsical forms — were placed on the shelves in tidy rows, wrapped and tagged in an orderly fashion. They looked starkly contemporary among the old books and ephemera filling the 1879 mint-green Victorian storefront, but not necessarily out of place. "Can we pick them up?" I asked. Brown nodded. "With art books, there's meant to be a personal, direct interaction between the artist and the viewer," he said. He handed me a three-dimensional, pastel-colored shoe. It was a loafer, with pages of text fastened on with a shoestring. "This one is called ‚ÄòThere was an Old Woman,' by Dorothy Swendeman," he said. I held the shoe in the palm of my hand, like a butterfly, studying the craftsmanship from every angle. This was a book? "A lot of the books from NORBAG's members look more like paper sculptures than traditional books, but they're based on very old styles of bookmaking that the artists have reinterpreted and reimagined," Brown explained. NORBAG — the North Redwoods Book Arts Guild — is the group of artists Brown chose to feature for Eureka Books' "Grand Re-opening Celebration" during Arts Alive!, on Feb. 2. The NORBAG exhibit fits in with the bookstore's long term "big picture" for Arts Alive!, which will be a focus on art exhibits with book-related themes. Brown and his wife, local author, Journal columnist and painter Amy Stewart, purchased Eureka Books back in December along with fellow book-lovers Jack and Peggy Irvine (also an artist). Since then they've been making the 20-year old bookstore their own, introducing a fresh vision and new ideas, including an Arts Alive! presence. Brown handed me another book, Margaret Beech's "A Star is Beautiful," an accordion-fold book with cut-out stars that unfolded when the book was opened. It was a delightful, delicate concoction. "How will you display these for Arts Alive!?" I asked. Brown smiled. "Amy's working on that one," he said. On cue, Stewart wandered to the back of the store, searching for something or other. "Did you see all the heart-shaped books?" she asked. I had indeed, already picking out my favorites for potential Valentine gifts. Nearly all the NORBAG books, as it turns out, will be for sale. Brown handed me the intricately assembled "Carnival Cats," another creation by Dorothy Swendeman, which he described as an interwoven accordion-fold design. "Many contemporary book artists use the accordion-fold structure for their books," he said. "In these books, pages can be turned one at a time or stretched out to make a single panorama. This kind of book seems far removed from a traditional book, yet it's actually based on the way scrolls were first turned into books more than 1,000 years ago. It's a very old idea with a contemporary twist." If there's anyone who knows about books, it's Brown. He's the co-founder and editor of Fine Books & Collections Magazine, the only full-color glossy magazine in the United States devoted to collecting books. "Scott has really worked hard to keep people engaged in the world of book collecting," said Stewart. "Before founding the magazine, he was a rare book dealer himself, issuing mail order catalogs and selling books online." We spent about an hour in the back of the bookstore talking about ‚Äòthe art of the book." I learned that the design for Ellen Golla's "flag book" — where three rows of pages open out simultaneously from the back of the book — was created in 1979 by a book artist named Hedi Kyle. I also learned that the use of elaborate presentation, a common feature in many of the NORBAG books, has its origins in Asia. "Japanese culture is known for its emphasis on presentation and design," said Brown. Even today, many Japanese books are wrapped in paper jackets, placed into slipcases and then enclosed in folding boxes. American book artists have adopted similar ways of presenting their books, with a sequence of actions needed to open the book. "I think this helps make the book seem more intimate and personal, and it forces the person looking at it to really focus," Brown said. Stewart wandered back through, searching for something else. "Did you talk about the big picture yet?" she asked Brown. "About how our Arts Alive! exhibits will be focused on all different kinds of book-related art?" At least a year's worth of book-related art exhibits are in the works at Eureka Books. "So many different art forms came directly from books," he noted. "Medieval painting was done to illustrate books. Etchings and woodcuts were developed as ways to make illustrations. There's a whole world of fine press books that involve handmade paper, letterpress type and handmade bindings. Even photography, within a year of being invented, was being used to illustrate books." This will be Brown's first foray into the Arts Alive! milieu, at least as a participant, but he has an interesting history with the event. "I helped plan the very first one, before it was even called Arts Alive!, when I was assistant director of the Main Street program. That was about 15 years ago, and I don't think we ever imagined that it would turn into such a successful event. It's great to be hosting one." The artists included in "Art of the Book" are Dorothy Swendeman, Ellen Golla, Kathy Marie, Peggy Marrs and Margaret Beech. More information about NORBAG can be found on the group's website at www.norbag.org. Eureka Books is located at 426 Second St. in Old Town, across from the gazebo.